PREDICT THE SCORE: Valencia vs Levante! Win an authentic LaLiga jersey and more! Here's your chance to win a LaLiga jersey and other attractive LaLiga prizes! By correctly predicting the score, you can earn yourself a chance to win an authentic jersey and more! 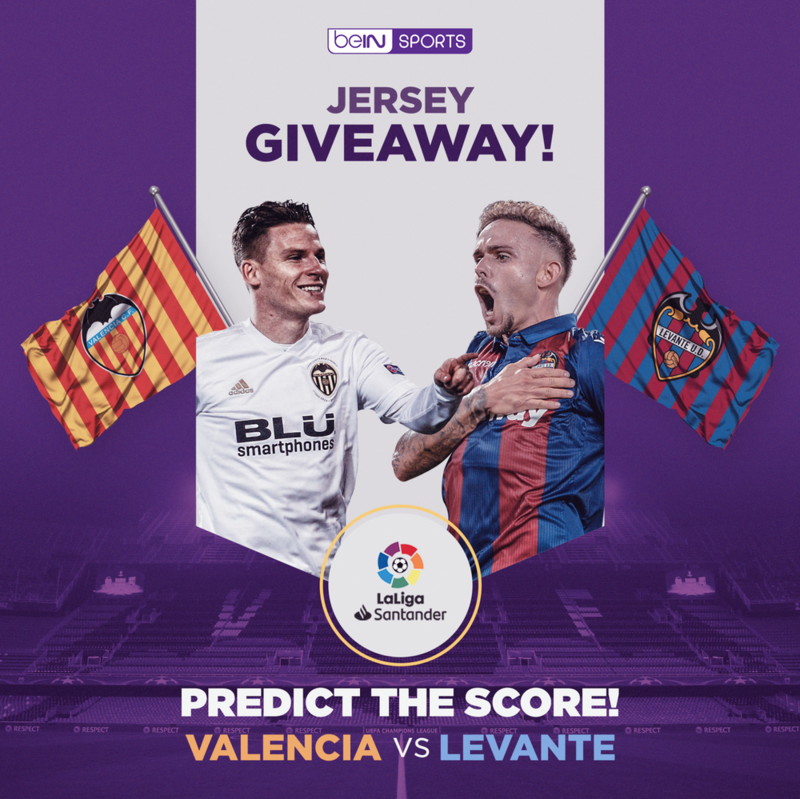 Step 1: Predict the score between Valencia vs Levante! Step 2: Submit your entry as a comment on our Facebook post. Step 3: Wait for us to announce the winner on www.facebook.com/beinsportsSGMY on 16 April 2019! Entry is free and open to residents of Singapore and Malaysia aged 18 and over at the time of Entry who have fulfilled the eligibility requirements as set out in these T&Cs (“Eligible Entrant(s)”). Employees (or Family Members of employees) of, any of, beIN SPORTS Asia Pte Ltd, any companies associated with the Contest and promotion of the Contest and all affiliates of such aforementioned companies are not eligible. “Family Members” means spouse, ex-spouse, de-facto spouse, child or step child (whether natural or by adoption), parent, step parent, grandparent, step grandparent, uncle, aunt, niece, nephew, brother, sister, step brother, step sister or 1st cousin. Only Eligible Entrants may be awarded and/or accept a Prize. The Contest begins on 12th April 2019 at 6 PM and ends on 15th April 2019 at 2.30am (the “Contest Period”). Entries must be received by beIN SPORTS within the Contest Period..
To enter, Eligible Entrants must visit https://www.beinsports.com/my/laliga-santander/news/predict-the-score-valencia-vs-levante-win-an-/1164076 during the Contest Period, follow beIN SPORTS SGMY Facebook account and provide his/her entry by commenting on the “CONTEST POST” with their entry answer (“Entry” or “Entries”). On 16th April 2019 at 12:00PM, beIN SPORTS will select two (2) winning valid Entries which best meet the judging criteria referred to in clause 7 as the winner. beIN SPORTS will notify winner via https://www.beinsports.com/my and an announcement post on our official Facebook page at https://www.facebook.com/beinsportsSGMY and publish his/her name (“Prize Winner”).